Thinking about changing out the locks to improve your home's security? Start here for a better grasp on when—and how—to rekey rather than replace them altogether. Key rings can get crowded (and heavy!) fast, when you consider all that you load up on them: keys for your car, front door, side door, back door, mailbox, maybe even your mother-in-law’s, and a handful of miniature rewards cards sized and punched to conveniently hang. Carrying that whole lot will cause your pockets to jingle with each step and you to waste precious minutes every day fumbling for the correct copy to the door or locker you are interested in opening. Fortunately, rekeying a few of your locks offers an easy, affordable, and even DIY solution can lighten your load. Understand when, why, and how to rekey a lock with this handy guide. A pin and tumbler lock—the kind of lock found on locking doorknobs and deadbolts—contains a steel cutaway that holds a cylindrical plug and a number of springs and pins that allow a specific key shape to turn in the lock. In order for a key to turn the locking mechanism, the configuration of the pins must match the depth of the unique grooves on that key. When you want the lock to open with a different existing key—say, so you no longer want to use separate keys to enter the front, back, and side doors—the lock must be disassembled and the pins, which are of various heights, removed and replaced by new pins that match the cuts and grooves in the new key. As mentioned, rekeying makes most sense for homeowners who prefer to have a single key that opens all of their door locks to the home or apartment. This process can lighten a full key ring to a few essentials, taking up less space in your pocket or bag as well as less time spent searching for the right one. However, rekeying a lock can also improve a building’s security measures. 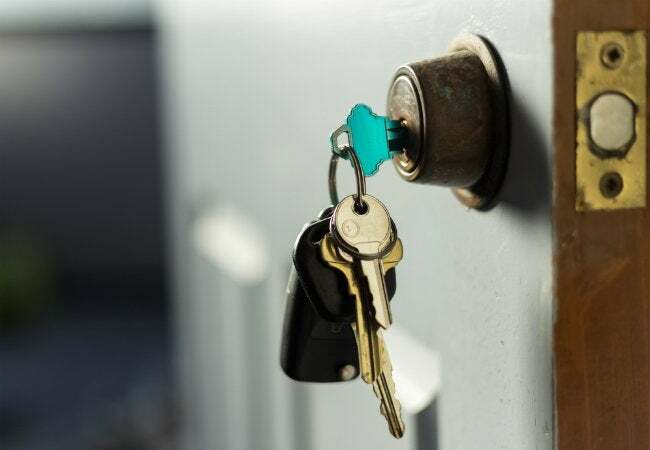 After a new home construction—during which a number of people might have copies of door keys, including contractors, subcontractors, and inspectors—new homeowners may want to make sure they have the only keys to their home before they take possession. Likewise, it’s also a common practice for landlords and property managers to have door locks rekeyed every time a new resident moves in. Whether you’re moving into a previously owned home or have simply misplaced a set of spare keys, rekeying is an alternative to replacing the lock altogether that provides the peace of mind that comes with knowing no one else has a key to your home. Both replacing and rekeying a lock effectively change out a lock to limit access, but there are some cases in which you have to go through the motions of both processes. • If you’ve lost the key that opens your existing lock(s), you won’t be able to disassemble the lock for rekeying. First replace the lock. • Rekeying won’t fix a worn or damaged lock. You’ll probably have to replace the lock with a cracked or warped locking mechanism soon, anyway, so consider doing so first. Then, if your goal was to change the locks so that you have the only key, you’re set; you only need to rekey if you want multiple locks to share one key. • When rekeying multiple locks to fit a single key, all locks must first have been made by the same manufacturer. For example, if your front door lock is a Schlage, the other locks you want rekeyed to match must also be made by Schlage. You cannot rekey a Kwikset or Sargeant lock to open with the same key as a Schlage lock, because different brands of locks have different size keyholes that only accept their own keys. If you’re dealing with multiple lock brands, you’ll need to decide on one and replace the others to match this brand before rekeying. Call a locksmith. This is the most expensive option. A locksmith will usually charge a set rate for a service call (often between $40 and $100) and then charge you an additional fee (potentially $10 to $30) for every lock you want rekeyed. Take the lock (locking knob or deadbolt) to the locksmith, local lumberyard, or hardware store. You’ll have to remove the lock from the door for this option and bring the key that currently opens the lock, but eliminating the house call makes this an inexpensive option. Expect to pay around $5 per lock. Purchase a rekey kit, made specifically for your brand of lock, and rekey it yourself. If you cannot find a local store that will rekey a lock inexpensively, you can purchase the necessary tools to rekey the lock. Purchase a rekey kit—for a single lock or up to five locks of the same brand—that matches the brand of lock you want to rekey. A rekey kit for a single lock typically costs between $12 and $25 dollars, depending on the brand and type of lock. 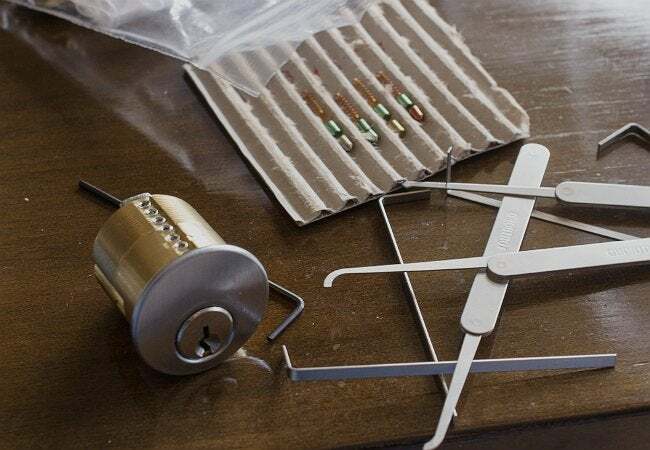 Hardware stores carry rekeying kits for some of the most common lock brands, but they can also be ordered from lock manufacturers and large online retailers, like Amazon. It contains everything you need to rekey the lock: tiny picks and tweezers, a key gauge (which is used to determine the depth of the cutouts on your new key), an assortment of pins and springs, to replace the existing ones in the lock, and any other tools you’ll need to dissemble and reassemble the lock. 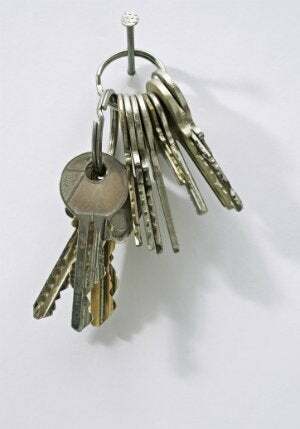 Some people—including apartment managers, owners of large office buildings, even regular Airbnb hosts—find it necessary to rekey locks frequently. To address this need, many lock manufacturers have introduced locks with smart-type rekeying technology that enables a manager to rekey the lock in less than a minute and without any disassembly. Instead, the lock’s design uses a special master key to facilitate the quick and easy rekeying, with the smart rekeying process varying from manufacturer to manufacturer. If you’re someone who would benefit from frequent rekeying, exploring today’s options could simplify your life and still tighten security at home.